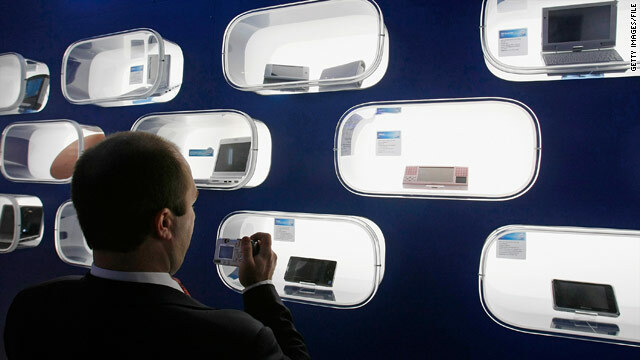 Tablet-sized wireless devices will be a hot item at the annual Consumer Electronics Show in Las Vegas this week. "In my 28 years of attending the CES and participating in it and being a part of it and running it for most of that time, I can honestly say there will be more innovation at this show than any one in history," Gary Shapiro said. This from the head of the yearly show that has launched such big tech ideas as compact disc players, high-definition television and Blu-ray. CES is the year's largest consumer technology trade show and one of the best chances to see new technologies before they hit the market. Despite Shapiro's enthusiasm, though, this week's CES buzz may be dampened by the lingering economic recession and the fact that big announcements from Google and Apple are likely to bookend the show this month. On Tuesday, Google is expected to launch its own mobile phone called Nexus One, and rumors are flying that Apple will unveil a touch-screen tablet computer January 26. Neither of the tech giants is scheduled to exhibit at CES, although Google said in an e-mail to CNN that it will attend a CES media event. Attendance at CES 2009 plunged 20 percent compared with 2008 numbers, largely because of the economic recession, Shapiro said. The number of people at CES this week is estimated to hold flat at about 110,000 people. Still, after a slump in 2009, some market analysts predict a brighter future for consumer electronics this year -- and the innovative CES that Shapiro predicts could blossom from this preliminary optimism. Here is our take on eight of the hottest consumer tech trends to watch at CES. Add your ideas in the comments below. And reply to this CNN iReport assignment with questions you would like CNN to answer at CES this week or cool gadgets you want to see. We will do our best to report back with answers. Size is everything in computing these days. Netbooks -- those 8- to 10-inch dumbed-down laptops -- were big news in 2009. This year, they may be eclipsed by an abundance of other midsize computing devices. "There's the large screen, which is the television. There's the small screen, which is the wireless phone or the smartphone," Shapiro said. "Then there's a middle category, where there's a tremendous opportunity for growth. "That's the netbook, the smartbook, the dualbook, the nettop, the desktop, the laptop -- tablets. There's a lot going on in that middle screen-size space." Toteable "tablet" computers ditch keyboards in favor of touch-screen interfaces. Apple's rumored tablet is getting all of the buzz from tech blogs, but Shapiro said CES will debut tablet computers that run on the Android operating system that Google produces. Bloggers expect Dell to be among the companies introducing an Android tablet. Heard of the Amazon Kindle? The Barnes & Noble Nook? The Sony Reader? All of these e-readers -- portable devices that let readers consume digital books without the eye strain caused by computer monitors -- will face new competition at CES this year. Look for an ultralight e-reader from Plastic Logic that's big enough to display a standard sheet of letter paper. It's called the QUE. Futurist Ray Kurzweil tells Wired magazine that he will debut a color e-reader interface at CES called Blio. The software is expected to work on a number of devices, from e-readers to tablets and phones. Look for new e-readers with color screens at CES as well. TV + Internet, or "Smart TV"
TVs will continue to morph into living room-based computers in 2010. The industry calls the new generation of televisions "Smart TVs" or "Connected TVs," and they do things like download Netflix films, stream Pandora music, check e-mail and communicate with other electronic devices in the home. The idea isn't especially new, but the interfaces are changing. Plus, Shapiro said, Internet-connected TVs stand to shake up the cable industry. "You may need the cable company to get broadband, but you may not need it to get cable services" when more TVs connect to the Internet, he said. One spinoff trend to watch: Several new services, like Boxee, offer interfaces to help couch potatoes surf Internet video without having to jump from one TV network's Web site to another. The software side of Internet-enabled-television trend is likely to be hot at CES as well. Boxee is expected to offer hardware that connects TVs to Internet content, too. In June, the U.S. switched from analog to digital television (goodbye, rabbit ears!). A quiet side effect of that change: U.S. television signals now can be viewed on mobile devices like smartphones and portable media players. Shapiro said mobile television will be a major focus of CES, and products that play live TV on the go should hit the market in 2010. Cydle, a South Korean company, says it will debut mobile TV products for cars. And iMovee announced that it will unveil several mobile TV products. Look for South Korean mobile phone and electronics maker LG to get in the U.S. mobile TV market as well, as is rumored by tech blogs. In the wake of hit 3-D movies like "Avatar" and "Up," several TV makers including Sony and Panasonic have announced plans to sell 3-D television to consumers in 2010. Most of the products demonstrated so far require viewers to wear clunky 3-D glasses in order for images to jump off of the screen. New at CES, Shapiro said, will be 3-D technology from 3M that does not require glasses for viewing -- as well as laptops and video games that display three-dimensional images. AMD and Blu-ray also say they will demonstrate high-definition 3-D home entertainment at CES. In December, Blu-ray announced that it had arrived at a technology standard for producing content in three dimensions. Cars are turning into computers. Ford and other automakers have announced in-car wireless Internet. Ford will offer one of the keynote addresses at CES, which emphasizes the growing importance of the in-car technology industry, Shapiro said. "We expect them to say something fairly significant," he said, adding: "They are also positioning themselves as a tech company rather than a car company." The emergence of mobile television also probably means live TV will come to automobile consoles and headrests soon. Once that happens, Shapiro said, a whole new avenue for the advertising industry will open up. A family watching TV in their car while driving through North Dakota, for instance, might see TV ads about local attractions and eateries. A trip to New York might yield entirely different ads. Despite the recession, smartphones -- those mobile devices like the BlackBerry and iPhone that work almost like computers -- were hot buys in 2009. Expect a fair bit of mobile-phone buzz at CES, although Google's rumored announcement of its Android phone on Tuesday -- and the absence of Apple, maker of the iPhone -- could dampen some of the intrigue. But Shapiro said new phones using the Android platform will be unveiled at CES. The Android platform, which runs on phones like the Droid and myTouch, also is expected to extend its reach from smartphones into other electronics like televisions. With consumer spending down, cheap buys like mobile phone applications and accessory electronics may take center stage at CES. Apple's iPhone is the dominant device for using mobile applications. The iTunes app store has sold more than 2 billion apps since it opened in July 2008. An iLounge at CES will feature 100 exhibitors with Apple-related products, including new mobile phone applications, Shapiro said. Expect that to be a big draw as iPhone owners look for the next big games and app functions. In addition to the apps, touch-screen cameras, a third generation of USB data cables and GPS add-ons for phones all could be big CES finds.